Yarn bombers have made our lives just a little bit cozier by wrapping woolly joy around everything from trees to bicycles. Crochet queen Olek, however, is famous for swapping fuzzy feelings for those of starstruck awe. In her latest feat, Olek took yarn bombing on a whole new track when she covered an entire locomotive with crochet in just two days. In her largest project yet, Olek and her art crew of four crocheted a colorful cover over a four-car train in Lodz Poland, a symbol of homecoming for the crochet queen, who left Poland to set up shop in New York City. 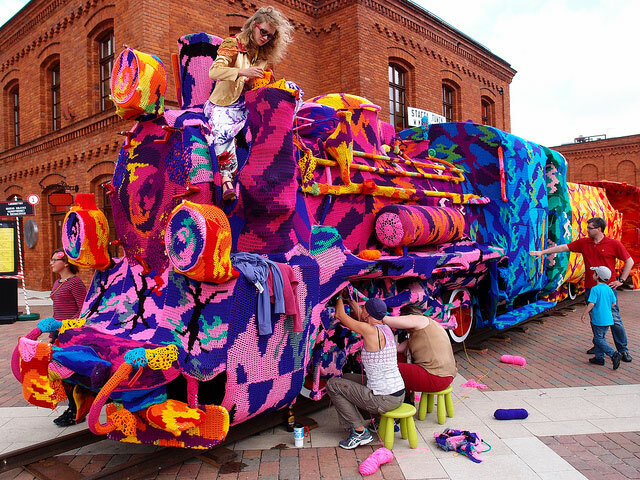 Olek’s crocheted locomotive made its debut on July 13 and will be on display until August 19. 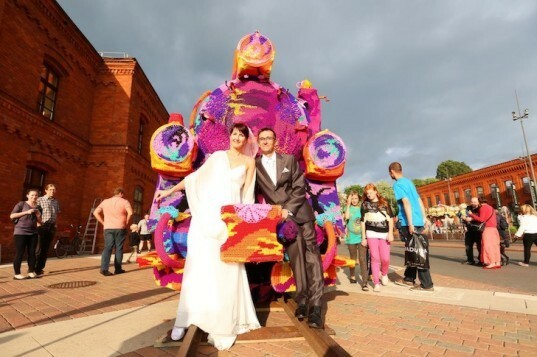 Wedding shot at the forefront of Olek's colorful, yarn-bombed four-car train in Lodz, Poland. The crocheted locomotive made its debut on July 13 and will be on display until August 19. The blank canvas for Olek's newest project: a shiny, no-nonsense four car locomotive. In her largest project yet, Olek and her art crew of four crocheted a colorful cover over a four-car train in Lodz Poland, as sign of homecoming for the crochet artist who is currently based in New York City. About her work, she comments: "life and art are inseparable. Anything that enters my life will be highlighted in crochet, either you like it or not." Olek worked around the clock for two days straight to finish her largest crochet art project. Olek uses crocheting as her medium for exploring life.